Shepherd's Lamb offers the highest quality organic wool blankets and throws. They are incredibly warm and made from locally sourced sheep wool. Shop here! 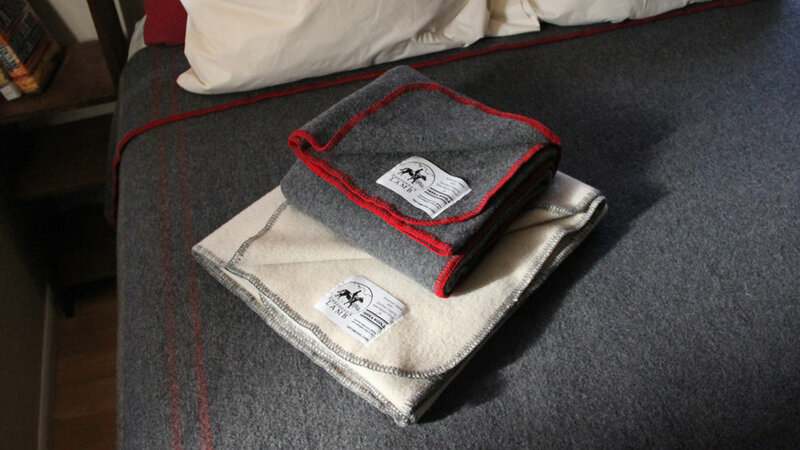 Shepherd’s Lamb wool blankets are amazing. They are incredibly warm without being too heavy or bulky. And the fact that they are made with wool from locally raised sheep means I am participating in and contributing to an important tradition of ranching in northern New Mexico. For centuries, sheep have shared their fleeces with people around the world and helped them endure harsh weather conditions. At Shepherd's Lamb, our flock of wonderfully generous ewes continue to provide not only for their own comfort, but yours as well. All of the wool used to make our Classic Wool Blankets comes from the flock pictured here. Read on to learn more about the blankets and discover some of the magical qualities of wool! In addition to its natural softness and non-allergenic properties, wool retains its composition for longer than synthetic fibers. While polyester fill compresses over time, wool continually springs back into shape, retaining up to 95% of its thickness throughout decades of use. Wool can last 20+ years, making it a superb investment. No need for expensive dry-cleaning, either – wool's naturally resilient fibers can be washed easily in the comfort of your home throughout years of use. When it's finally time to retire your blanket, you can rest easy knowing that wool is 100% biodegradable. Wool absorbs moisture, keeping a dry layer of air next to your skin that helps hold in body heat. Because it has a porous fiber core, when you air your blanket it releases moisture, refreshing it over and over again. From the northern New Mexico mountains where our sheep reside to the small New England mills where the wool is spun and woven, we are proud that our blankets are 100% Made in America. Our blankets come in three classic colors: Grey, White, and Blue. While the White and Blue blankets are solid colors, the Grey blankets have faint herringbone stripes in yellow, red, and blue. The color of the thread on the edge of the blankets varies. If you would like a specific trim color, please inquire for availability when you order as our stock fluctuates throughout the year. The white blankets are made from natural, undyed white wool. The gray and blue blankets are dyed exclusively with low-impact, Fibre-reactive dyes. These dyes do not contain toxic chemicals nor mordants, are highly colorfast, and are classified as eco-friendly by the Oeko-Tex Standard 100, an international certification process. Our blankets are priced by size and shipping is free. Our smallest "Baby" size comes in just under two feet square and can also be used as a Lap Robe to keep handy on the couch when your Long Throw is in the wash. Our Twin, Full, Queen, and King sizes will keep you warm on the most cozy and spacious of beds. Purchase a blanket from our online shop – shipping is free! Click here to shop for blankets. 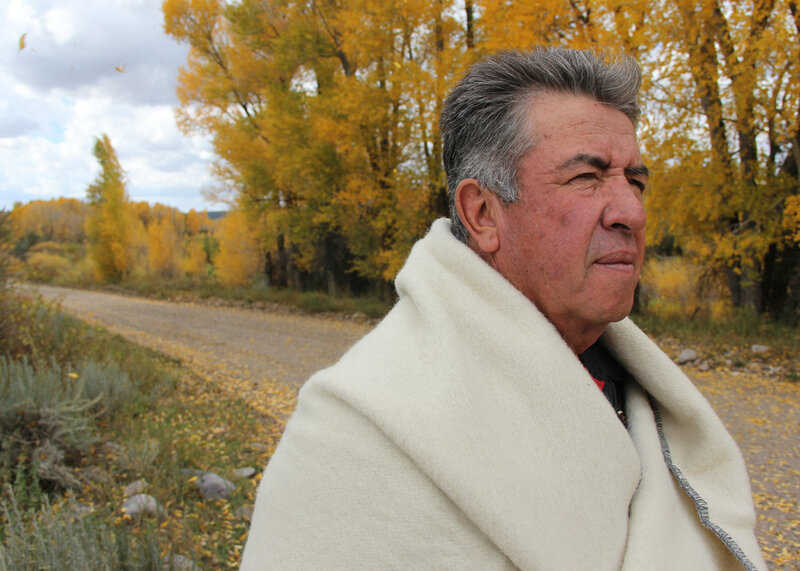 If you are in northern New Mexico and would like to pick up your blanket in person, you can visit the Shepherd's Lamb stall at the Santa Fe Farmers Market. Antonio is at the market most Saturday mornings and has a stock of blankets, yarn, pelts, and meat for sale. Click here for Farmers Market info and directions. Our blankets are also sold at Tierra Wools handweaving workshop in Los Ojos, New Mexico (12 miles south of Chama, just off Highway 84). Click here for directions! Lara Manzanares and Osa, one of the flock's guard dogs, stay warm on the ranch.